Tokyo --- JFE Steel Corporation announced today that it has begun producing its recently developed “GI JAZ” high-lubricity hot-dip galvanized (GI) steel sheet, which offers dramatically improved press formability for use in automobile bodies. Commercial production for automobile manufacturers is now under way at JFE Steel’s West Japan Works. GI steel sheet, which is hot-dip galvanized to coat its surface of steel substrate with pure zinc for strong corrosion resistance, is used mainly by European and American automobile manufacturers. GI JAZ incorporates the high-lubricity technology used in “JAZ” (JFE Advanced Zinc) on GA steel sheet, which is heated after galvanizing to alloy the galvanized layer with iron of steel substrate to improve its spot-weldability and corrosion resistance after painting. JAZ has garnered a favorable reputation for its excellent press formability and is mass produced mainly for Japanese automobile manufacturers. Most overseas automobile manufacturers use GI steel sheet or electrogalvanized (EG) steel sheet for rust-proof parts. Pre-phosphated EG steel sheet (EG Prephos), which is coated with an outer layer of zinc phosphate for high lubricity, is widely used because of its good press formability, but it incurs high processing costs for electroplating and zinc phosphate coating. GI JAZ, which achieves formability equal to that of EG Prephos, also boasts a reduced friction coefficient because its surface modified layer , like that for JAZ (Fig. 1), reduces adhesion between the stamping tools and galvanized layer (Fig 2). GI JAZ, similar to JAZ, allows automobile manufacturers greater freedom in vehicle structure and design, and helps them to stabilize press processes and reduce defects. 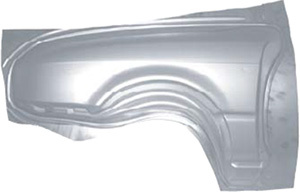 Press forming tests of GI JAZ were performed with an automobile fender (Fig. 3). The range of blank holding force that enables good press forming without any cracking or wrinkling was twice as wide as that for common GI steel sheets (Fig. 4). Furthermore, since GI JAZ’s surface modified layer is very thin as nanometer-level in thickness, JFE Steel has demonstrated that GI JAZ offers spot-weldability, bondability, phosphate treatability and coatability equal to that of common GI steel sheet, which are necessary performance to steel sheet for automotive applications. JFE Steel, while building up its GI JAZ supply system, aims to develop other unique new products to satisfy customer needs going forward. JAZ™ and GI JAZ™ are registered trademarks of JFE Steel Corporation.